Pantai Selat Baru is the most beautiful beach in Bengkalis, the name is taken from the name of the village where the beach is located, Selat Baru village, which is also the Capital of District Bantan. Bengkalis Government has made these beaches as one of the potential attractions. In this place, there are annual events that been held for competitions, such as jong boat racing, gasing, and kites. The visitors can also see numbers of traditional art and cultural attractions from Riau. 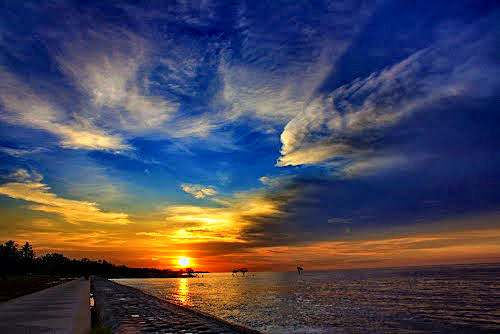 Pantai Selat Baru is situated in the village of Selat Baru, District Bantan, Bengkalis Regency, Riau Province. This place is located at the north of Bengkalis capital; from Bengkalis, within approximately 17 kilometers or about 45 minutes driving by using a two-wheeled or four wheels vehicle. From Pekanbaru, the capital of Riau province. the visitors can use water transport to navigate the Siak River to the port of Bengkalis with the distance of approximately 5 hour, or can also use a landline for about 5 to 6 hours, by passing through Siak until then passing the River Pakning towards Bengkalis. We can use Fery crossings or commonly referred to Roro. This beach is kind of stretch and flat beach with fine sand that strung along 4kilometer, with the distance for about 200 meters from the beach. The ocean waves at this beach is relatively stable, not more than 1 meter, except at the north wind season. From this place refracts blue nuance of Gunung Ledang in the neighboring country, Malaysia.